Pyramid 5300 workshift timer that allows many Pyramid clocks ring bells! 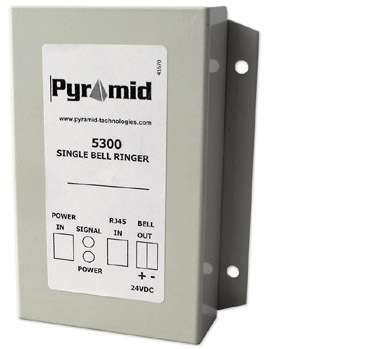 The Pyramid 5300 is a separate one circuit external signal controller. It works as an add-on to various Pyramid clocks, sending out a 24VDC pulse. 6 or 8" low voltage bells. It has 72 signal event settings and is controller by the included software. is one event, not five. One. The signal event time is synchronized with the master clock. 12:30 might be 3 seconds long ("back to work!"). Or in the case of a school, 2 seconds any time of the day. then run any existing sounding devices you already have in place. We know how to link these to intercom systems.